Unai Emery felt Arsenal showed they can mix it with the best teams in the Premier League with the help of their supporters as they defeated Manchester United 2-0 on Sunday. Granit Xhaka's early strike caught out David de Gea at Emirates Stadium, before a contentious penalty, dispatched by Pierre-Emerick Aubameyang, sealed a home victory. Arsenal handed Ole Gunnar Solskjaer his first Premier League defeat as United caretaker manager and, given the quality of their opponents, Emery was particularly enthused. "Above all, I am very proud of our supporters," he told Sky Sports. "They pushed us a lot and helped us a lot. This atmosphere is a big atmosphere that helped to create a big performance for our players. "United were in a very good moment after their game against Paris Saint-Germain, but I think here we showed we can play and impose with a big performance also, because we have good players. "Against this team, to take this confidence and three points in the table gets us in a good position for our target. I am very happy with the players." Arsenal are now fourth, two points ahead of United, with eight games remaining. 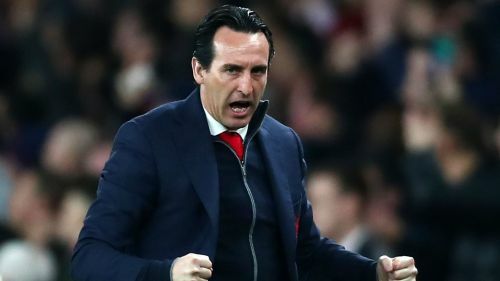 But while Champions League qualification is in their own hands, Emery is keen to put that battle to one side as they look to overturn a 3-1 first-leg deficit in the Europa League against Rennes. "We are going to think of the next match and the next match in the Premier League is against Newcastle United but in three weeks," he said. "Now our focus is the Europa League on Thursday. It is a very important match after our defeat away. "We have to recover the players, prepare for this match and create a big atmosphere like today. I hope the supporters make the stadium full to create this atmosphere."